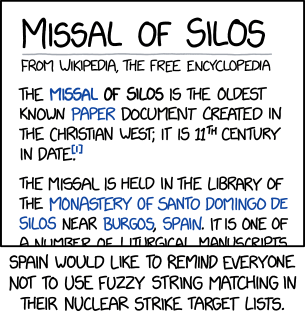 The Missal of Silos is the oldest known paper document created in the Christian West; it is 11th century in date. Spain would like to remind everyone not to use fuzzy string matching in their nuclear strike target lists. Alt-text: Welcome to Wyoming, motto "We'd like to clarify that Cheyenne Mountain is in Colorado."